WooCommerce Subscriptions Review : What you can do with it?? WooCommerce and the plugins designed to work around it has made it possible to create a fully functional website with distinguished features in minutes. No spending days on design and coding! Just download WooCommerce for free and install it and start selling online. For further enhancements, there are a number of plugins and add-ons that you can install and use to add specific features to your online shop. The time when creating subscriptions based websites took weeks or months is now gone. This amazing WooCommerce plugin is crafted to let you sell your products and services for subscriptions. It is a way to allow your visitors to make recurring payments effortlessly. Check out this list of the best Hotel booking websites and find what they’re doing right. Alternatively, you may also use an equally good, affordable Woocommerce subscriptions aleternative plugin. We recommend Subscriptio – WooCommerce Subscriptions for your Ecommerce site. WooCommerce is hands down, the best and most powerful eCommerce plugin for WordPress. For me, it is the first name that comes to my mind when I hear WordPress eCommerce. It is popular because it is FREE, easy to use, and very flexible. What makes it more proficient is the fact that there are many products (plugin, addons and themes) that are designed around it. WooCommerce subscriptions is one such extension that integrates with WooCommerce to enable your eCommerce website with the subscription features. So, you get the power and flexibility of WooCommerce and the subscription features of WooCommerce subscriptions. It is designed to sell simple as well as variable products on subscription. Just like WooCommerce, it is feature rich too!! Read on, to find out why it is best for collecting recurring payments. Subscription based products can be simple or variable. You can sell simple products or services through WooCommerce subscriptions, similarly, with a little more configuration you can sell variable products as efficiently. When selling online through WooCommerce, you can add product variations. For instance, you are viewing a shirt that you want to buy online. So the website offers you to choose the color of the shirt from the options available on the product page. You can even select the size variations right on the product’s sales page. This plugin helps you sell services, downloadable as well as physical goods on subscriptions. If you are about to provide some service on subscription, WooCommerce subscriptions is the best choice. It lets you define the one time sign up fee when that is to be charged when a user starts using your service. If you don’t want to charge the sign-up fee, that too is possible. You can also provide free trial period to your prospect customers. It is always nice to let your customers try out your service before they sign up for it. Here are a few tips and tricks to create successful subscription websites. The whole concept of subscription is about renewal, that the service/product is sold on a recurring basis. WooCommerce subscription lets you choose if you want to system to automatically charge the subscriber for each renewal till the subscription cycle ends. Or if you just want to inform subscriber and wait for him to take action and pay manually to renew his/her subscription. WooCommerce supports automatic renewals. When automatic renewals are enabled, the subscriptions of your customers will be auto-renewed at the end of the previous subscription period. This kind of renewals don’t require and user action and deduces the subscription amount from the user account to renew the cycle. So the service/product will continue. However, at any point, the user can cancel the subscription and automatic renewals to avoid getting charged in the future. This plugin not just lets you accept recurring payments automatically, it also lets you collect payments manually through manual renewals. This feature is useful for the people who want to manually pay for their subscriptions. So, instead of already accepting the payment and automatically renewing the subscription, the user will be sent an email reminder to renew his subscription. The user can then manually pay for the subscription and renew it. Selecting the payment gateway is one of the most important decisions you will make about your website. When selecting a payment processor, there are many factors you must consider. For instance, here are the things that you should consider while choosing the payment gateway for your subscriptions. If it suits the size of your business? There are many such things you should consider before choosing a payment gateway. Make this decision wisely because a payment processor directly deals with the financial transactions taking place on your website. Refer this WooCommerce document to find out your ideal Payment gateway. WooCommerce subscriptions is very easy to integrate into your website. You can install and start using it just like you do with any other WordPress plugins. Once installed and active, an additional tab for subscriptions will be created under the WooCommerce menu. The only prerequisite that you need to satisfy to using WooCommerce subscriptions is that you should have WooCommerce installed and active. Adding subscription-based products is as easy as adding simple products. For simple subscriptions, you just need to add the subscription price, duration and the cycle time and you’re ready to go. Here is a help article to add simple products for subscriptions. The process of adding variable products is just a little different. This is because, for such products, you’ll need to specify different subscription prices and other particulars like the tax, duration etc. But that too is simple, with the intuitive options and this guide on how to create variable subscriptions using WooCommerce subscriptions. WooCommerce subscriptions is not just powerful but flexible too. Basically, it lets you sell simple products as well as variable products using WooCommerce subscriptions, but there’s a lot more to it. With your ecommerce website, integrated with this plugin, you can get creative. It opens up new opportunities to sell your products and services the way you want. You can sell services, downloadable and physical products using it. For instance, while selling downloadable products you can decide if you want to allow download only when the payment for the renewal is made. So you can sell pretty much anything. A service, online tutorials, online magazines, or some physical products that are delivered to your customer’s doorsteps at a fixed interval. For the payment processing too, you can choose from a wide range of supported payment gateways, manual or automatic renewals, set the sales period and the discounted price, etc. WooCommerce subscriptions is a premium WordPress plugin to enhance the functionalities of your basic eCommerce website created with WooCommerce. Being a premium product, you are provided support for one year. WooCommerce subscriptions is rather a simple plugin with simpler options. It’s easy to use and learn! One year worth of support is enough to grasp the concepts of this plugin. After that, you probably won’t even need to reach the support and ask questions. One of the best things about WooCommerce subscriptions is it’s in-depth documentation that you can refer while setting up your products. You’ll find everything well documented at WooCommerce subscription documentation. Explanation about any feature or option that you are confused about, can be found here. Expensive?? No, I’d say it’s worth it! Being a premium product, WooCommerce subscription costs $199 with a year of support and updates. It seems expensive at first but that is a price you pay for the excellent features. Once you start using WooCommerce subscriptions, you’ll realize that the product is worth it. The thing that makes WooCommerce subscriptions better than any other subscription plugin is that it allows unprecedented product customization. You can create the product of your choice and offer subscription plan as per your requirements. The possibilities of what kind of subscription you create with WooCommerce subscriptions is unlimited. There are a few Subscriptions alternatives that you can go for, but I highly recommend WooCommerce subscriptions. 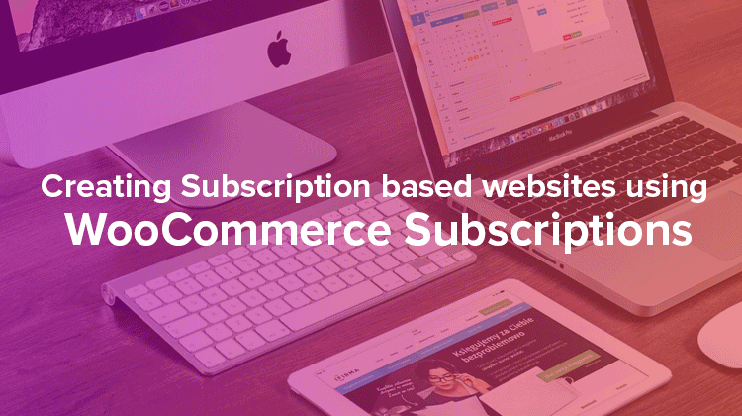 Also, read – Types of subscription websites you can create WooCommerce subscriptions. WooCommerce subscriptions is a total subscription management system that allows you to accept recurring payments. For more information, you can refer our WooCommerce Subscriptions FAQs. When you look at the setup guides and WooCommerce subscriptions help documentation, in fact, the setup process for products based on WooCommerce looks very difficult. However, when you try to implement it practically, it wouldn’t be the same. You’ll find that it, in fact, easy. Using WooCommerce subscriptions is as easy as using mobile applications. You won’t need any technical knowledge to do so. Any non-technical person can use the plugin and run a subscription business online using WooCommerce Subscriptions. Creating and managing websites that accept recurring payments is not a piece of pie. But with WooCommerce subscriptions, you just have to configure the options. And all the options are intuitive and easy to understand. While you setup your website, you can seek the assistance of the support and even get your queries solved with the documentation. If you are looking for a solution for creating a subscription based website, WooCommerce subscription is highly recommended.